City and the Students' Union extend a warm welcome to all new and returning students at Welcome Week. Welcome Week kicked off in style, with over 70 events delivered by the Students' Union, including Freshers’ Fair, students speed meets, movie nights and Henna workshops. New students also had the opportunity to join group visits to famous London locations like the Natural History Museum, Royal Academy of Music and The Sky Garden. City Sport were in attendance throughout the week showcasing the wide range of trophy winning sport societies that City has to offer. 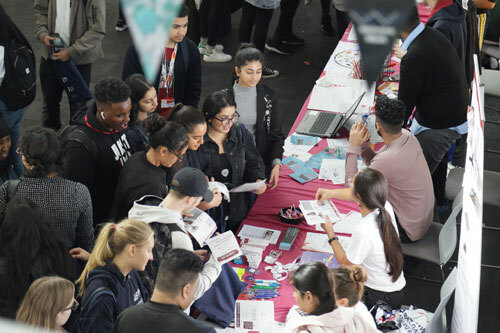 A highlight of Welcome Week was the two day Freshers’ Fair, which saw around 5,000 students make the short walk to the Business Design Centre in Angel to see the 140 stalls and get a taste of campus life at City. Donnell Balogun, (Electrical and Electronic Engineering), said: “The way that the Fair has been set up is really cool, as everything is accessible and there is something for everyone. “I came with an open mind, but I’d like to join something musical as outside of my course I play the keyboard and use Logic Pro on my Mac. Nina Meyer, (GDL, Law), said: “I didn’t expect there to be so many societies, so it is great to see this many people with different interests. I am hoping to find a Hip-Hop Society, and if there is not one then maybe I’ll form one myself! “These Fairs are a great way to meet people and make new friends. I have already signed up for the Law Society, Pro Bono Society and the Krishna Consciousness Society, so I will be quite busy. “I did my undergrad in Germany and chose to come to City because of The Law School. I actually searched for former City students on LinkedIn and messaged them asking about their experiences of the university and they all recommended it. For more information or to see the full list of events check the Students' Union Welcome to City page.